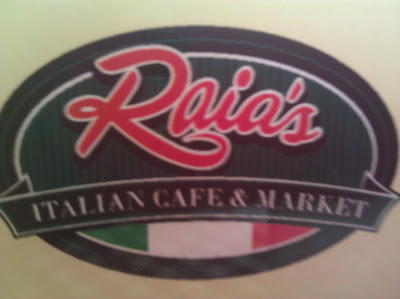 Today we went to Raia's Italian Cafe & Market. This is a nice family owned restaurant. The food is great. I had only been here one time before and loved the food, portions, and total dollar spent. 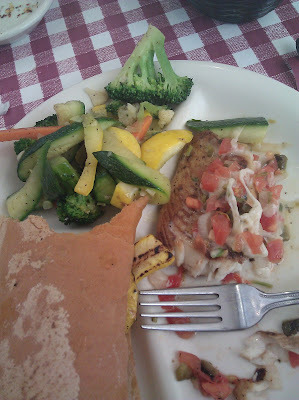 One of the main reason's for picking this place is their lunch buffet (any three items for $6.95). They have a menu for each day that you can pick from. Any 3 items. They also have their regular menu if you do not want the lunch buffet. Check out our plates with our 3 choices- This is my plate and sorry I started eating before I took the picture. I had the Tilapia, veggie panini, and veggies. This is my husband's plate. 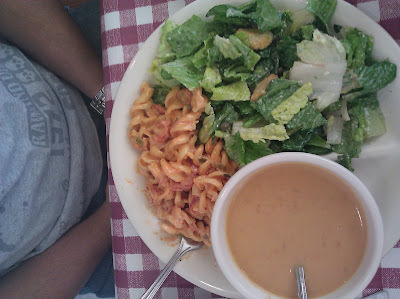 His choices were the lobster bisque, Ceasar salad, and pasta with crawfish. Our total with drinks and tip was $19.67. You can't beat that for great tasting food, two full tummies, and a great enviroment. I recommend for you to try the shrimp salad, it is great. Also, one of your choices can be a dessert for those of you with a sweet craving. By the way, you inspired me. Christy and I used to talk about your blogging whenever we worked at Vativ. Anytime... will you be joining us at blogger events?